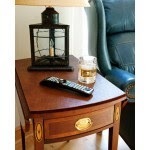 Table Saver - Custom Made Table, Leaf, Buffet & Server Pads: CUSTOM TABLE END PADS - PROTECT YOUR END TABLES!! Remember to get pads for your end tables. That is where most spills happen. Keep them protected with our awesome custom made pads starting at just $64.99 - that includes shipping and a lifetime warranty! !